The 2016 edition of Moogfest will happen May 19 – 22 in Durham, North Carolina. This year’s lineup includes Explosions in the Sky, Sunn O))), Gary Numan, Blood Orange, Julianna Barwick, The Orb, Holly Herndon, Daniel Lanois, Simian Mobile Disco, Ben Frost, Floating Points, Kode9, Hundred Waters, Empress Of, Mad Professor, Moses Sumney, Mac McCaughan, Lunice, Ryan Hemsworth, Tim Hecker, YACHT and more. Festival passes are on sale now. Numan will be performing his first three albums (Replicas, The Pleasure Principle, and Telekon) over three nights at three different venues. 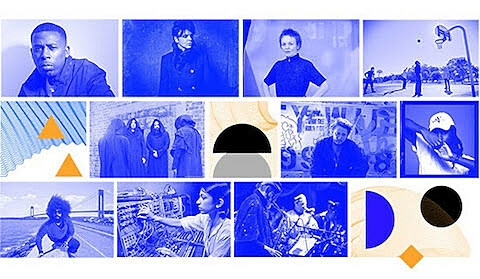 Laurie Anderson will also perform her show “The Language of the Future” that weaves stories and songs, and will also appear at a Moogfest “in conversation” event. Reggie Watts (who is also appearing) announces the lineup in a video with one of his improvised loop pedal performances, which you can watch below. Or you can just check out a list of all announced performers below too. Electronic music pioneer Gary Numan will perform his first three albums (Replicas, The Pleasure Principle, and Telekon) over three consecutive nights in three different venues. Musical experimentalist Laurie Anderson weaves stories and song in her solo performance, “The Language of the Future” and then returns to the stage the next day to hosts a daytime conversation. Headlining talent also charts a zig-zagging course across today’s synthesizer infused pop landscape, from the vibrant electronic duo ODESZA, to the future soul of Blood Orange (playing in North Carolina for the first time), a return of utopian rockers YACHT, and even the comic stylings of Reggie Watts. Immersive noise and minimalist sonic-scapes from some of today’s most progressive experimental artists, including sunn O))), Ben Frost, Tim Hecker, Silver Apples, Oneohtrix Point Never, Quintron & Miss Pussycat, Olivia Block, Alessandro Cortini, and Lotic. A rich program of sustained tones and cascading moods led by Daniel Lanois, Brian Eno’s prolific Grammy winning protege, Suzanne Ciani, and the UK’s originators of ambient house The Orb. 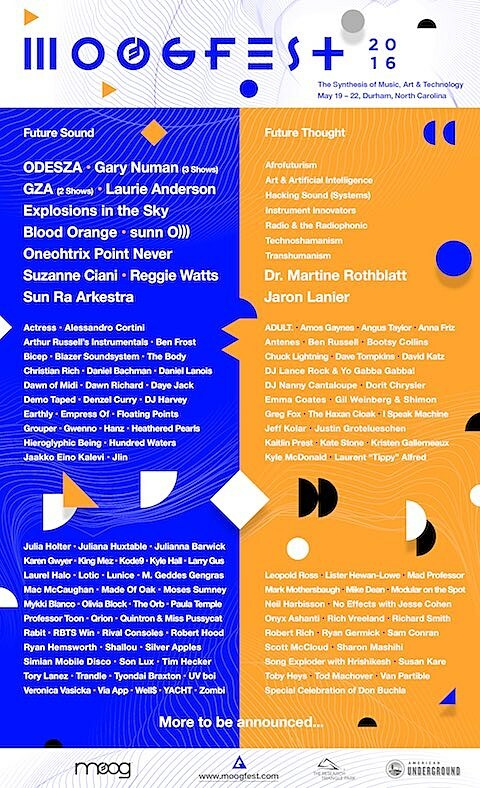 GZA leads Moogfest’s strongest ever hip-hop and rap lineup, supported by a roster of emerging talent including Lunice, Tory Lanez, Denzel Curry, Dr. Dre protege King Mez, and Well$. Futurist philosophers set the tone for a mind-expanding conference. Keynotes by Dr. Martine Rothblatt, author, entrepreneur, transhumanist, inventor of satellite radio, and Jaron Lanier, a computer scientist and composer who has pioneered the field of virtual reality. Other visionaries include sound explorer Onyx Ashanti and his ‘exo-voice’ sonic prosthesis, Tod Machover from MIT Media LAB presenting his work in HyperInstruments, and Gil Weinberg and The Robotic Musicianship Group at Georgia Tech performing with Shimon, an improvising robotic marimba player that uses artificial intelligence. The intergalactic voyagers of Sun Ra Arkestra channel the cosmic philosopher himself. Arthur Russell’s Instrumentals ensemble, making their US debut. Floating Points’ live project veers fluidly from warm electronic to jazz to sonic space rhythms. Ryan Hemsworth brings together a crew of international DJ/producer friends for a kick-off party. Celebrated king of late-night disco, DJ Harvey gets down with other dance and techno luminaries Robert Hood, Kode9, and Simian Mobile Disco, with ascending masters Kyle Hall and Paula Temple who will be transforming a downtown venue into a deep, dark dance party. This day-to-night program, curated by Richard Smith, features performances from masterminds in analog sound, including Grammy-nominated producer Suzanne Ciani and Nine Inch Nail accomplice / solo artist Alessandro Cortini. Smith’s personal collection of Buchla instruments and documentation, one of the world’s most comprehensive, will be on display throughout the festival weekend. Free and open to the public, an entire day of music programming and workshops that celebrate electronic music for kids of all ages. Hosted by DJ Lance Rock & Yo Gabba Gabba, with Mark Mothersbaugh, Bootsy Collins, DJ Nanny Cantaloupe, thereminist Dorit Chrysler, Johnny Bravo creator Van Partible and creative scientist Kate Stone. Also, Modular On the Spot, an outdoor modular synth performance and picnic-style gathering. Durationals are three to four-hour-long experimental sessions with immersive visuals. Liturgy drummer Greg Fox kicks off the series, followed by legendary hip hop producer Mike Dean, innovative electronic composer Suzanne Ciani, and others. Ambient, tribal, and trance music pioneer, Robert Rich performs the ultimate durational performance with a 10-hour sleep concert. An afternoon of intimate church performances by the joyously hypnotic singer songwriters Julianna Barwick, Moses Sumney, Daniel Bachman, Julia Holter, and 2015 Welsh Music Prize Winner Gwenno making her US Debut. The first human Cyborg, Neil Harbison curates a provocative conversation about Transhumanism. Chuck Lightning, of Janelle Monáe’s Wondaland Arts Society, organizes an Afrofuturism program. Ryan Germick, leader of the Google Doodle team, hosts an expanded talk-show about The Future with guests including veteran Pixar story artist Emma Coates, and cartoonist and comic theorist Scott McCloud. A conversation with journalists Angus Taylor, David Katz and artists Laurent “Tippy” Alfred, Lister Hewan-Lowe, and Mad Professor culminates in an outdoor Saturday party with a true-to-form reggae soundsystem. Mad Professor also leads a masterclass as part of the daytime program. Explore radio as technology and practice with Megapolis Audio Festival and Anna Friz, Jeff Kolar, Kaitlin Prest, and Sharon Mashihi. Popular audio podcasts, Song Exploder from Hrishikesh Hirway, and No Effects from Tanlines’ Jesse Cohen, will be recorded in front of a live audience. A daily exploration of music in science fiction and horror films opens with ADULT. performing a live score to The Three Grace(s) Triptych, I Speak Machine live scoring three of their science fiction shorts, The Haxan Cloak and Leopold Ross in conversation following a screening of Crocodile Gennardiy, plus It Follows with composer Rich Vreeland. The expanded film program continues with Future Projections, a program of short film and video work drawn from 125 years of techno-prophecy, curated by Ben Russell. Interactive media art and immersive sonic environments throughout the festival, including a 50th anniversary tribute to the 1966 performances by Experiments in Art and Technology. New commissions and site-specific collaborations developed in partnership with the Research Triangle Park, innovation consultancy IDEO, artists Kyle McDonald and Lori Napoleon aka Antenes. Charting a course for the future, Moogfest invites attendees to participate in workshops, expert demos, and masterclasses. The program ranges from the experimental, to the practical and professional-for either novice or expert. Masterclasses are hosted in theater spaces, while workshops in classrooms and labs throughout the city are limited to small groups. Stay tuned for schedule and registration details.